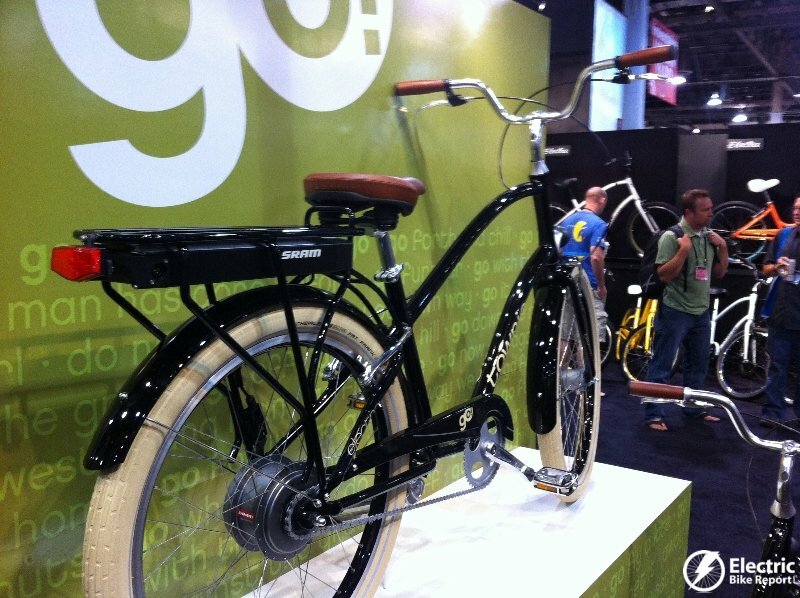 In case you don’t know, Interbike is the largest bicycle trade show in the US and it is held every year as a way for bicycle brands to present their new products and meet with dealers to determine sales plans for the coming year. 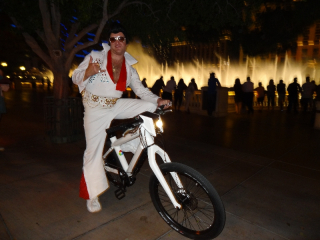 The show has been held in Las Vegas Nevada for a number of years. 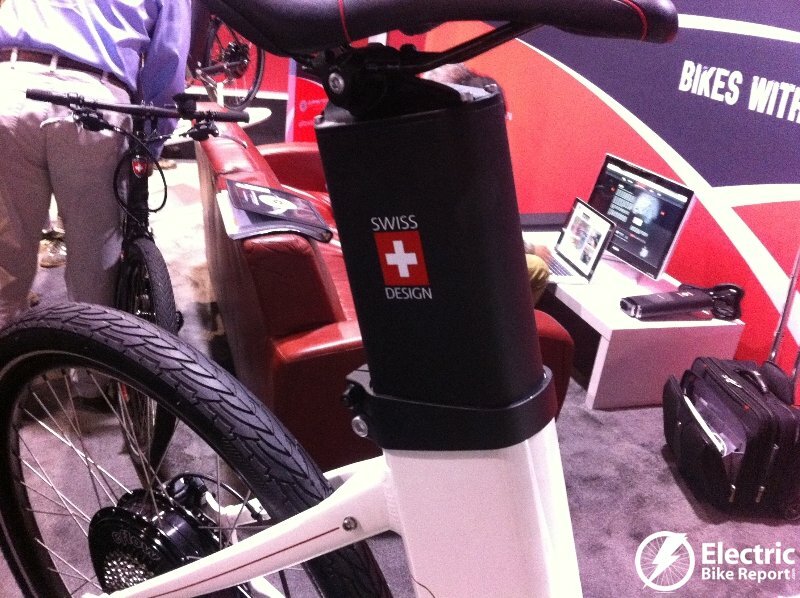 In previous years the electric bike scene at Interbike has been pretty mellow with the traditional brands launching new products. 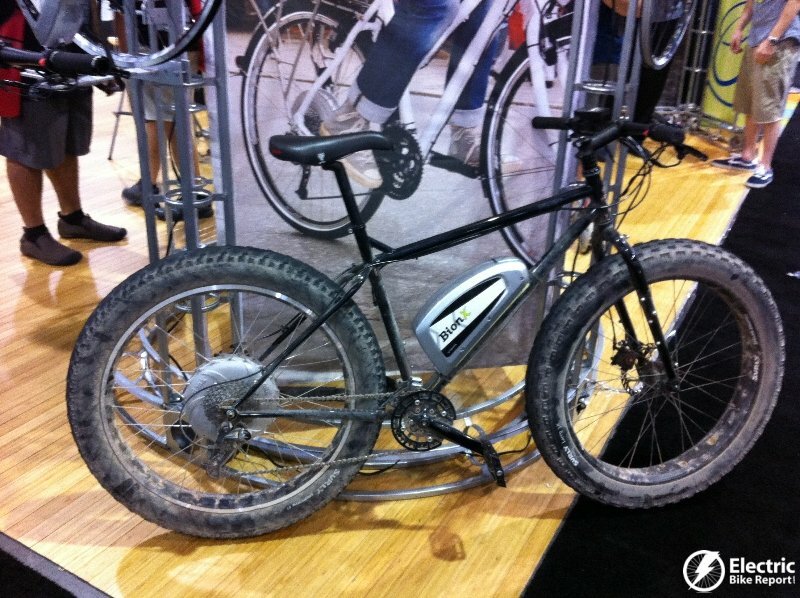 But this year was different! 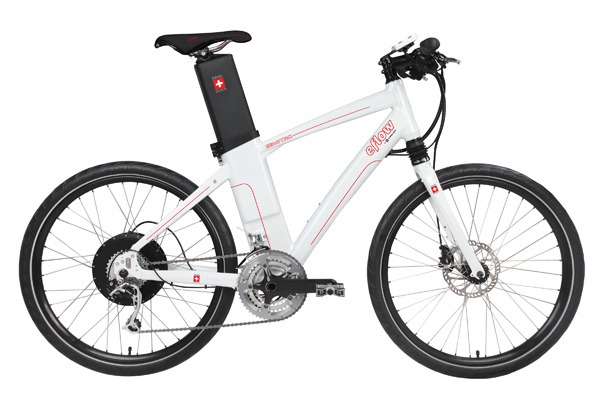 The traditional brands were launching new styles of electric bikes and there were a lot of new brands joining the e-bike market. 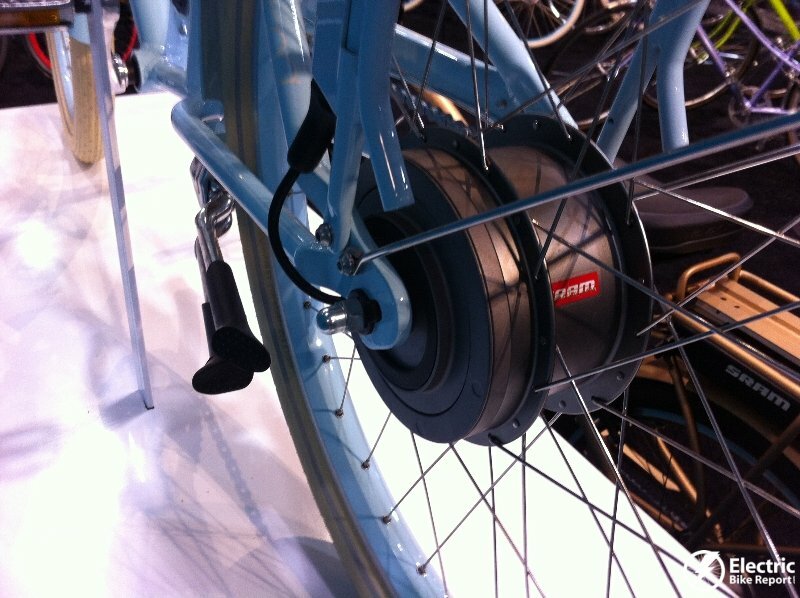 The European brands are beginning to focus their attention on the US market as the next frontier. 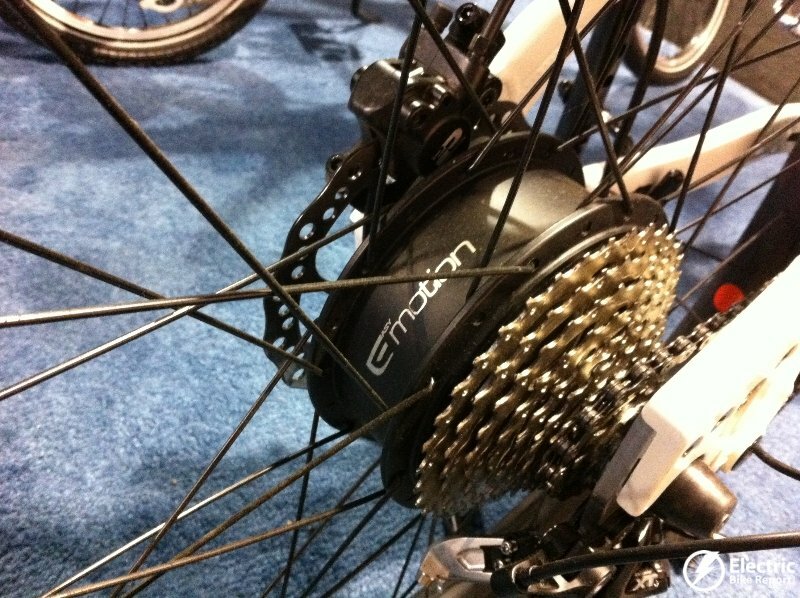 Brands like Grace, Smart, Stromer, Haibike, Diavelo, Emotion, and Ego Kits to name a few. 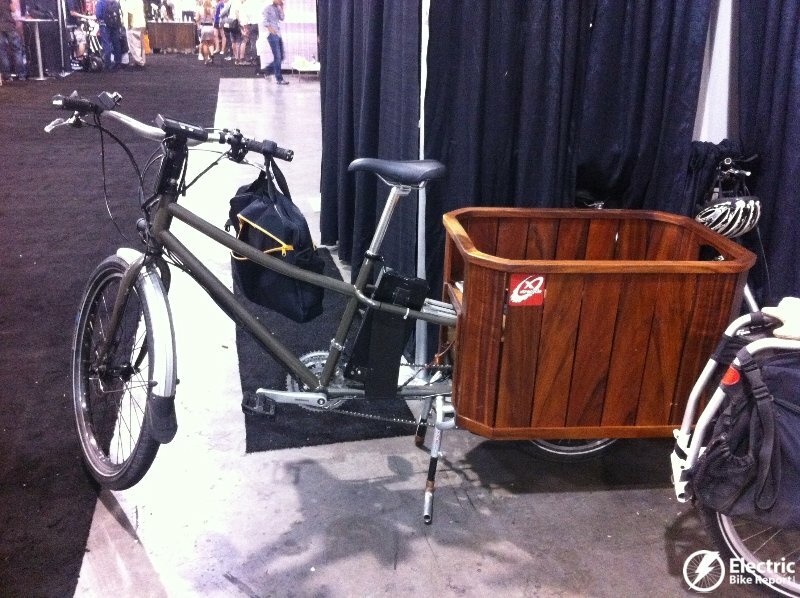 Electric cargo bikes are also an emerging market in the e-bike scene. 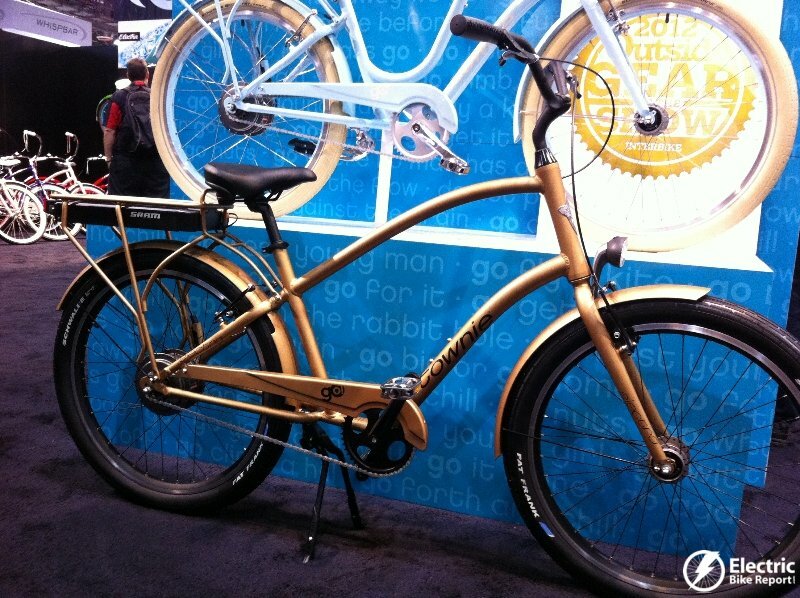 These are versatile bikes that make running errands around town much easier. 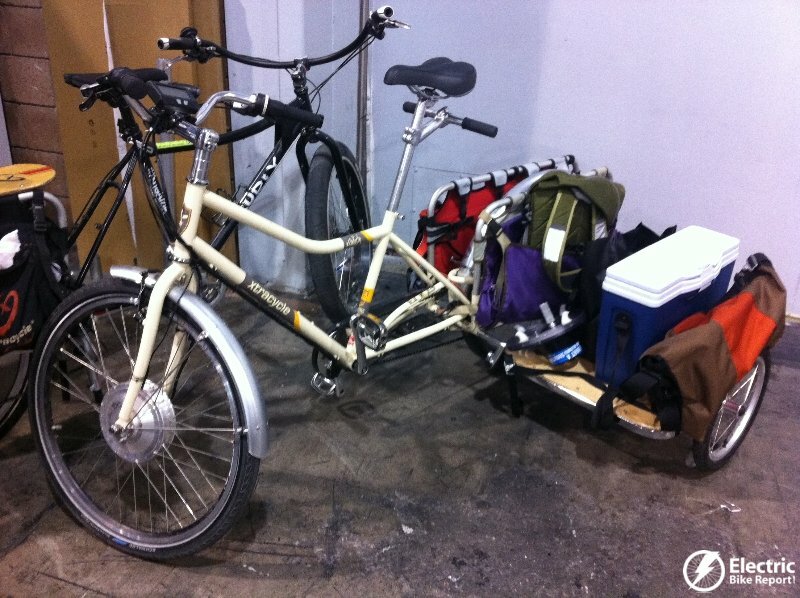 They are a great car alternative 🙂 Xtracycle, Yuba, and Pedego had e-cargo bikes on display. 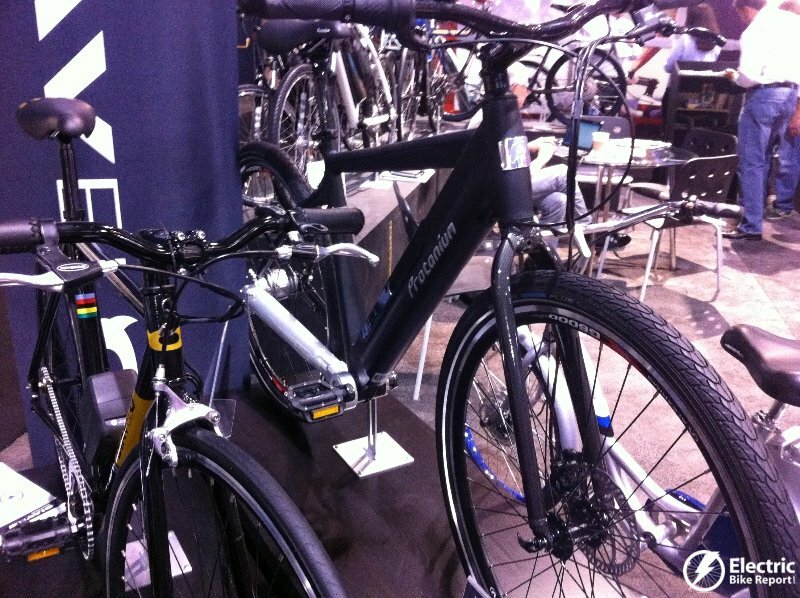 The electric mountain bike niche has been a big hit in Europe and it seems to be expanding in the US, the country where mountain biking originated. 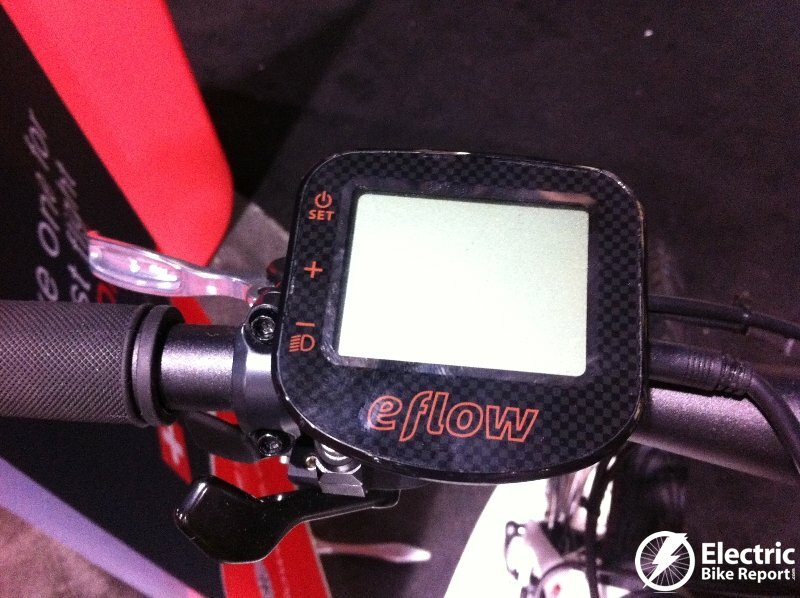 Brands like Haibike, Emotion, Stealth, Ego Kits, Energie Cycles, etc. 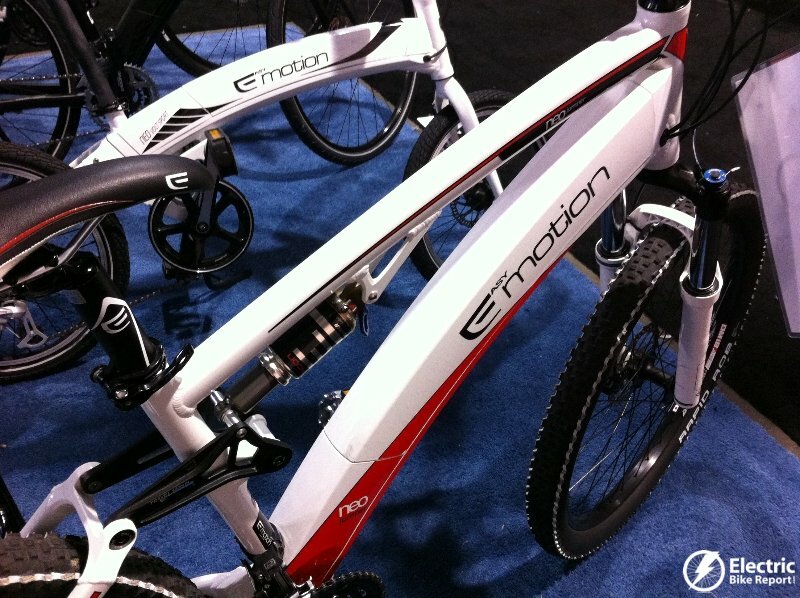 are offering e-mtbs. 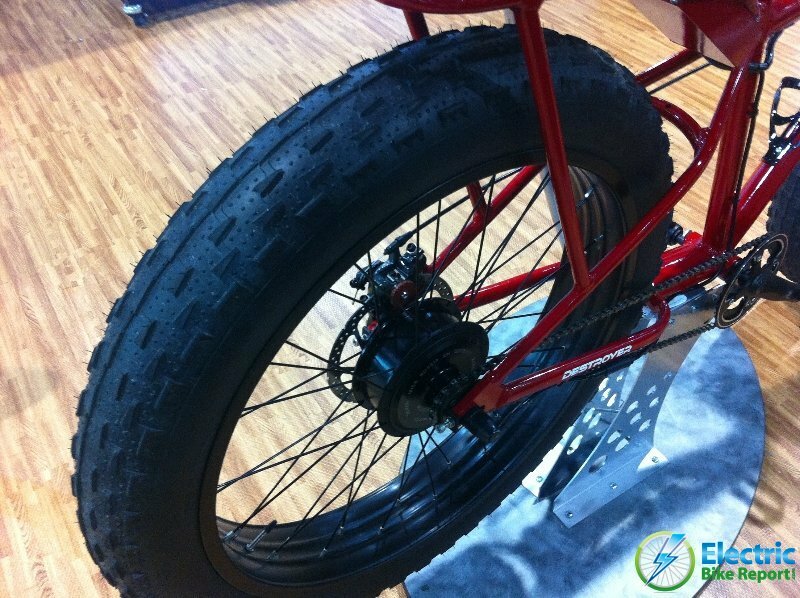 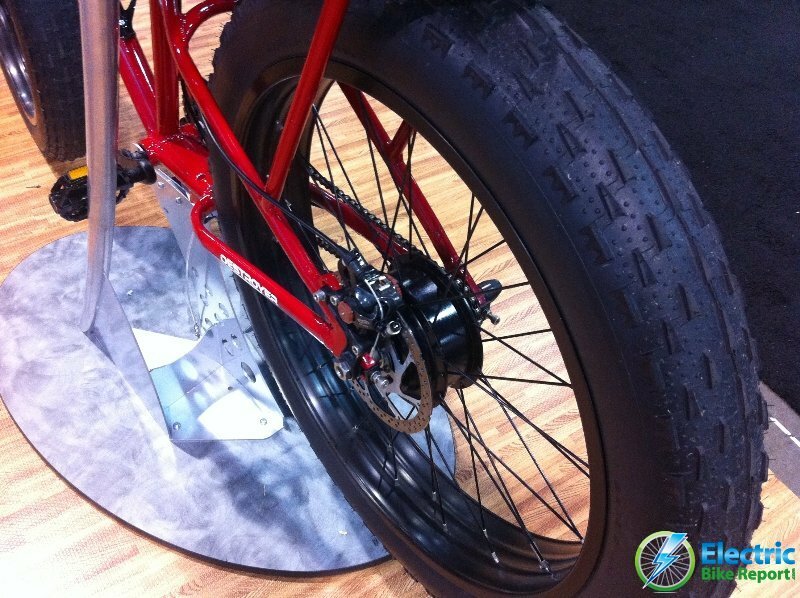 Along similar lines are the electrified “Fat Bikes” or bikes that have 4″ wide fat tires. 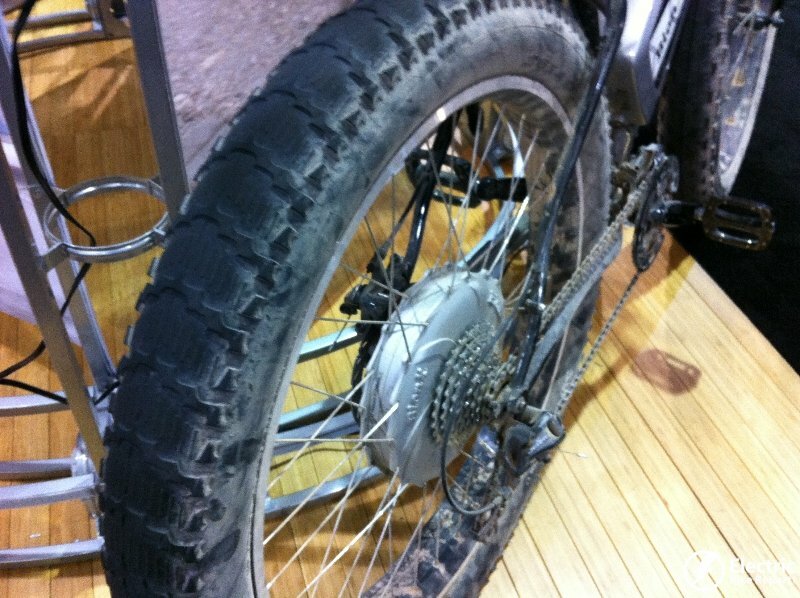 These are good for trails, dirt roads, sand, snow or almost any kind of terrain you can think of! 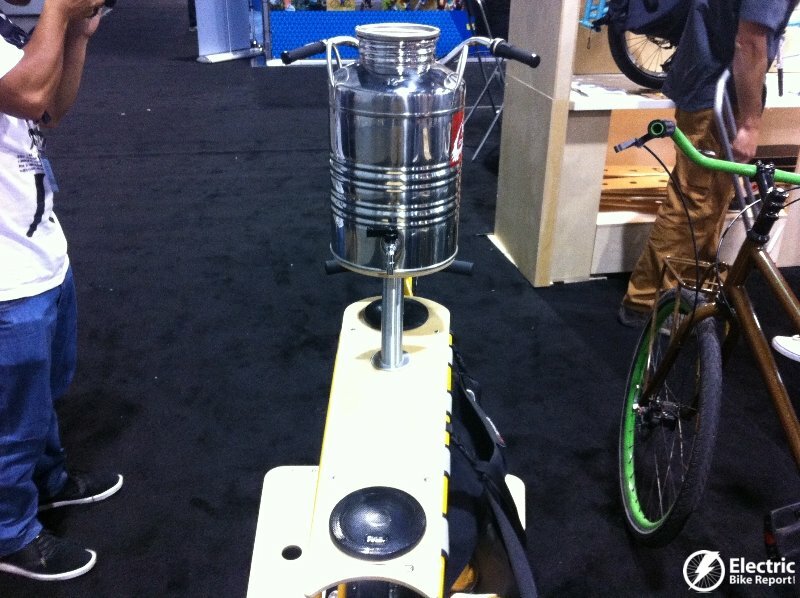 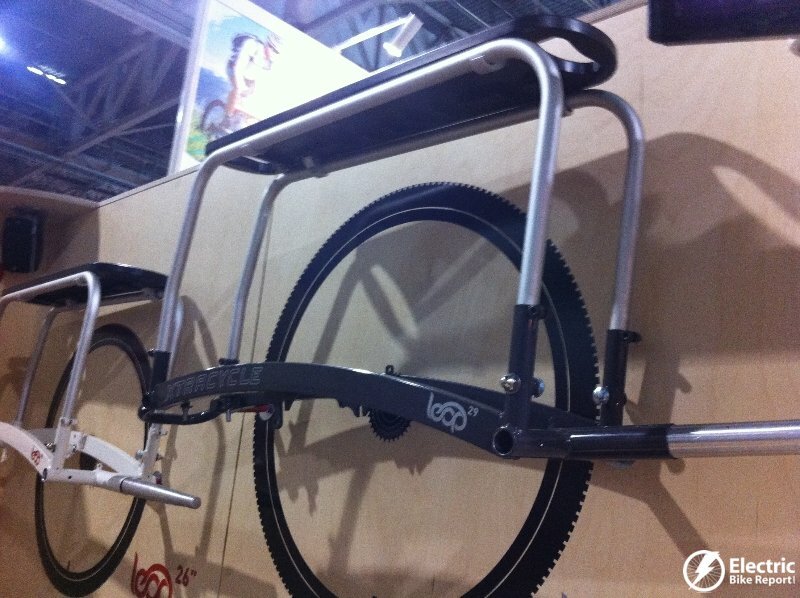 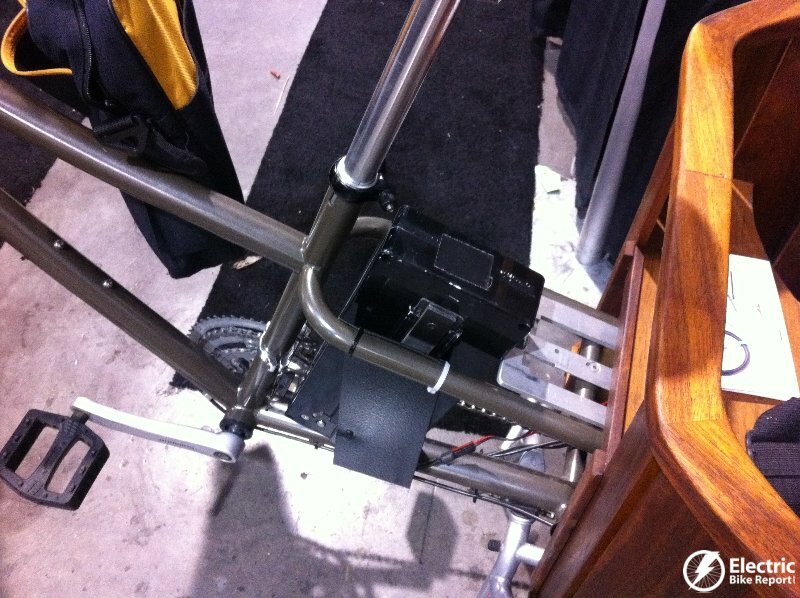 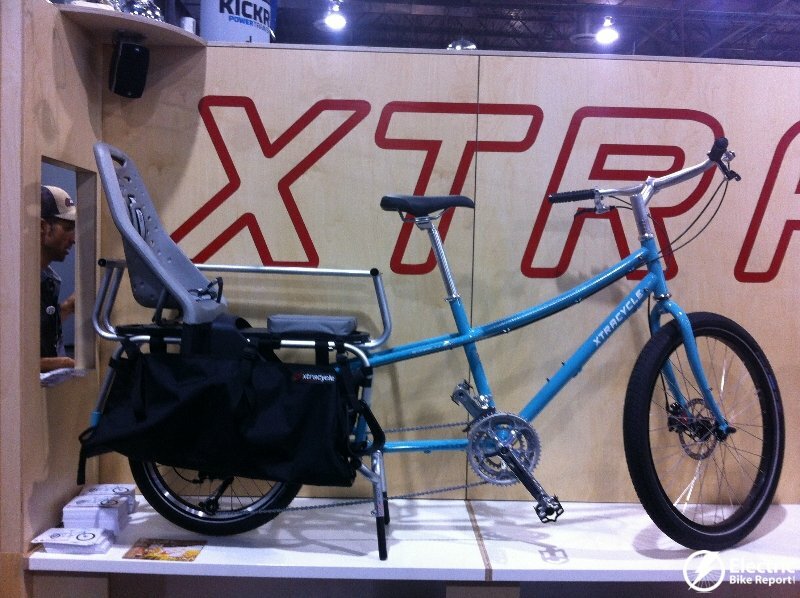 The Pedego Destroyer is a good example and Bionx added their kit to a Surley Pugsley. 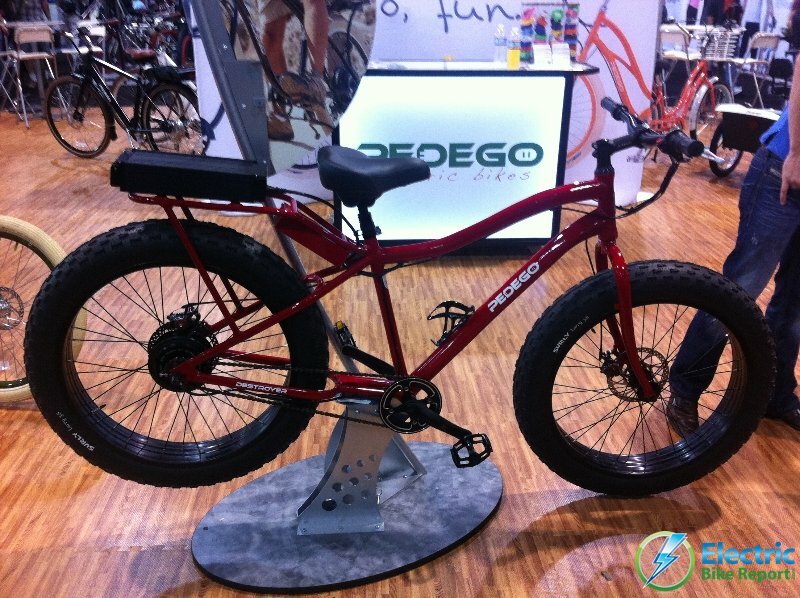 Speaking of Fat Bikes, let’s start off the pictures with the Pedego and Surley bikes. 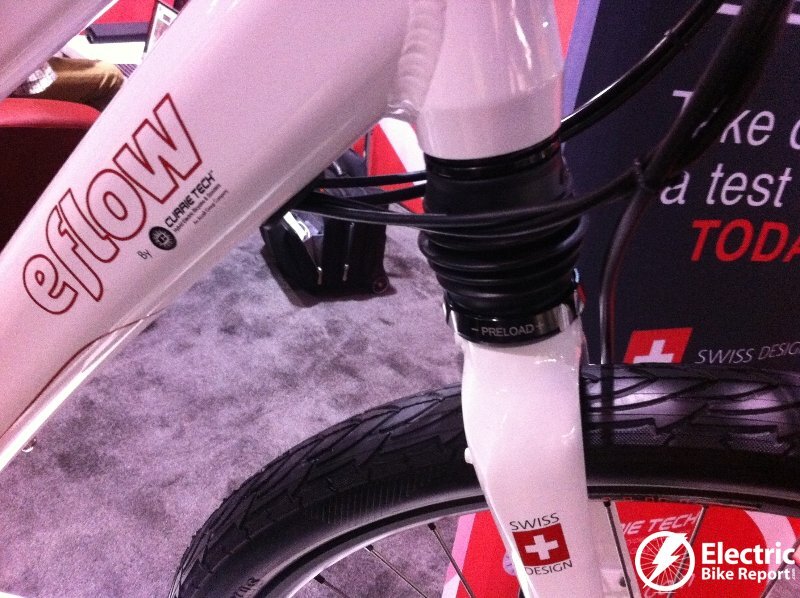 Currie Technologies showed off the new eFlow electric bike with the battery integrated into the seatpost! 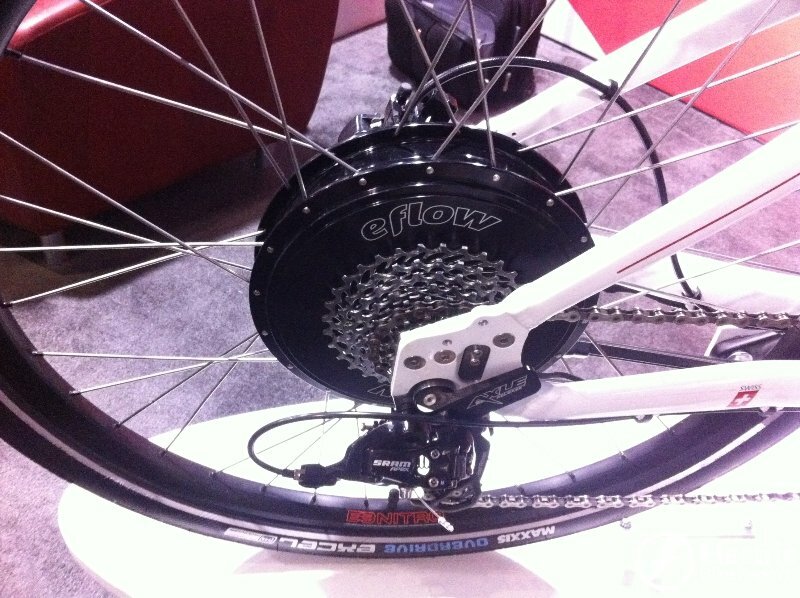 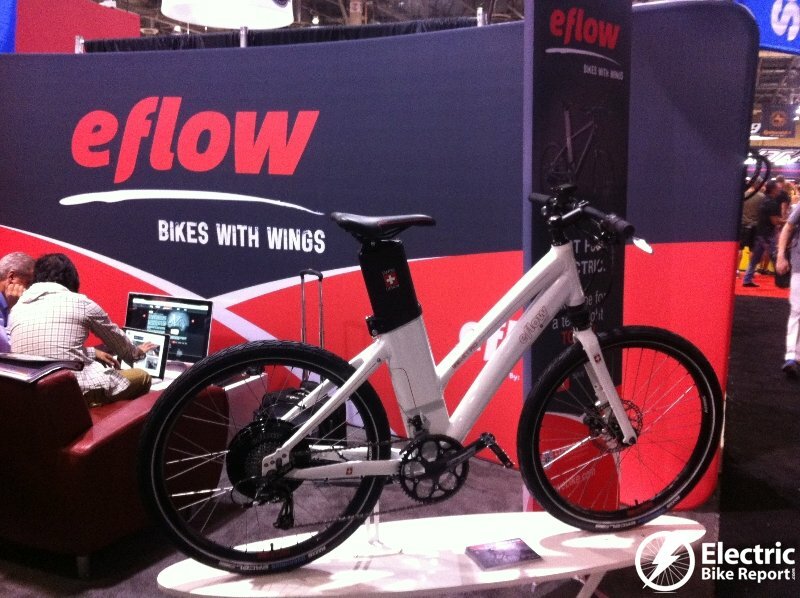 Here is more information of the eFlow electric bike. 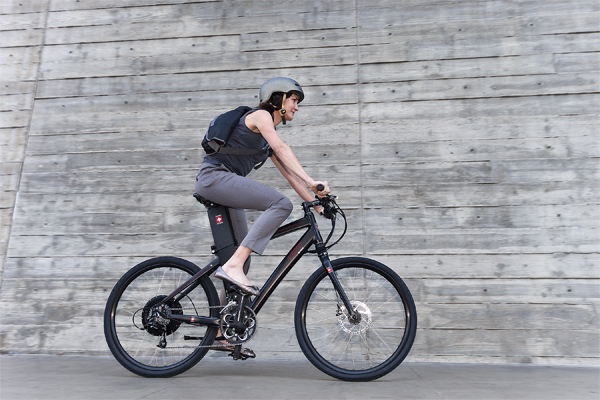 Electra has waited on the sidelines for a while when it comes to electric bikes because they wanted to launch a “clean” electric bike without a lot of wires. 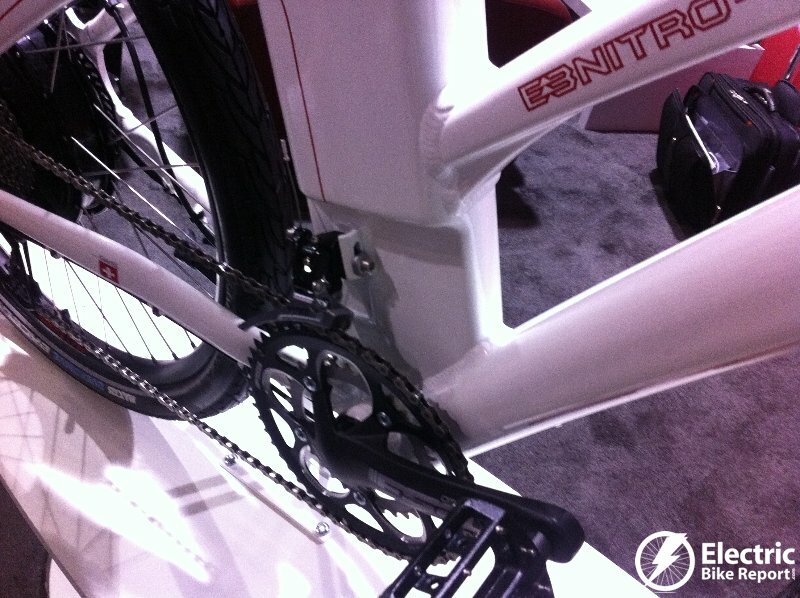 This year they are launching their Townie Go electric bike with the SRAM 2 speed electric bike kit. 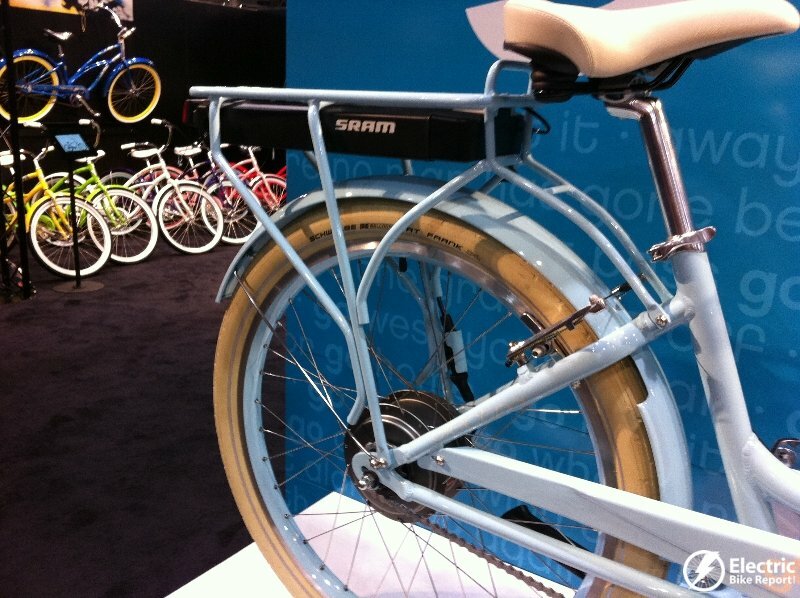 The bike definitely is clean and stylish! 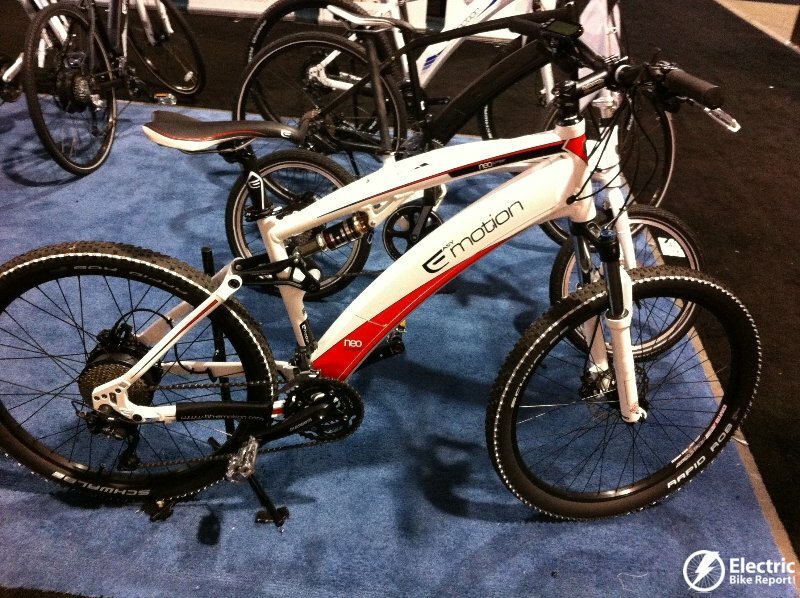 Emotion had quite a line up of their Neo electric bike line that integrates the battery on top of the downtube. 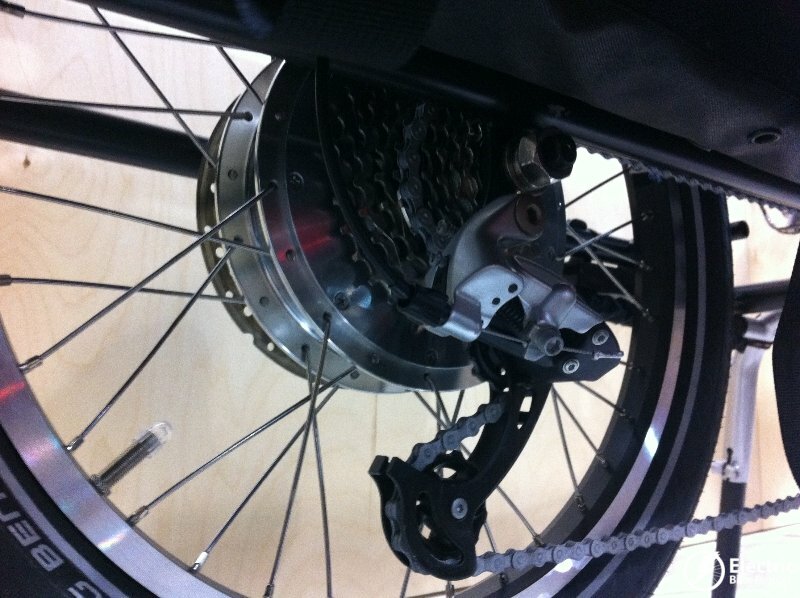 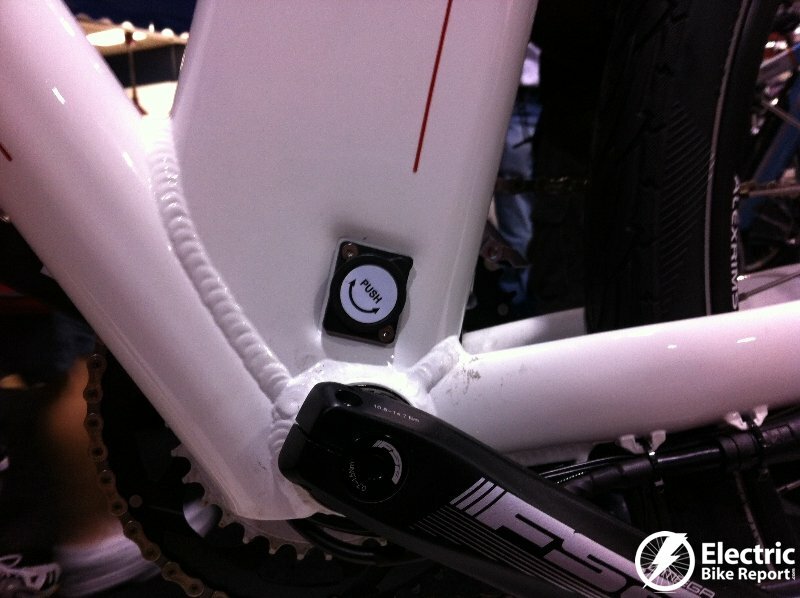 These makes for a clean look with the ability to easily remove the battery pack for charging away from the bike. 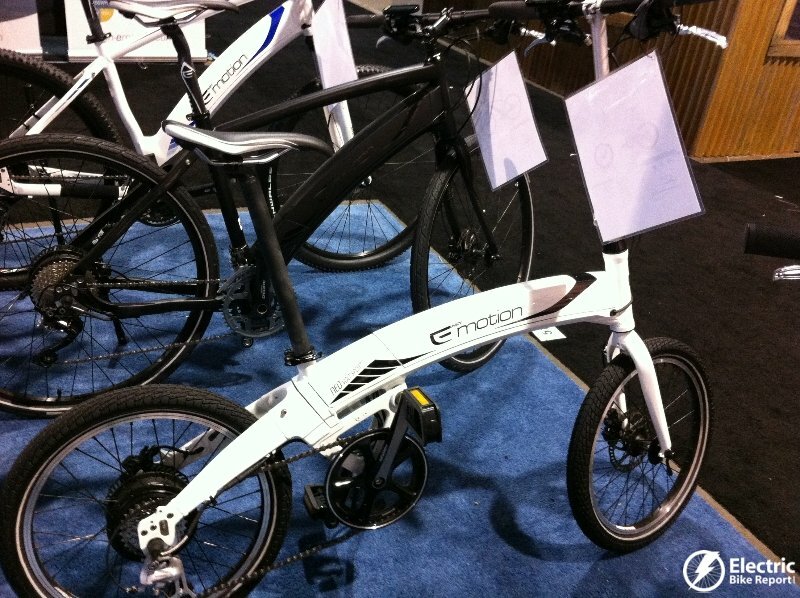 They had a 29er mountain bike, a full suspension mountain bike, a carbon fiber frame hybrid style city bike, and a folding e-bike. 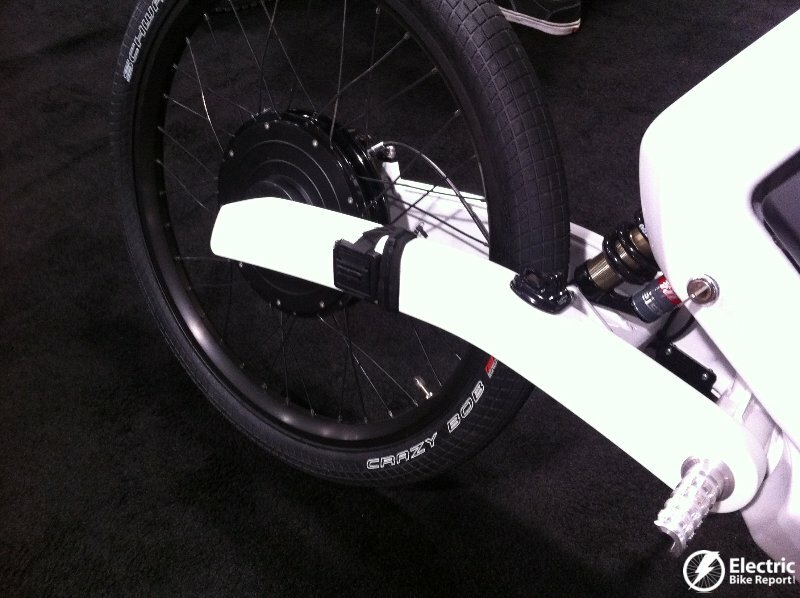 The Feddz electric scooter/bike was an eye opener with it’s unique design. 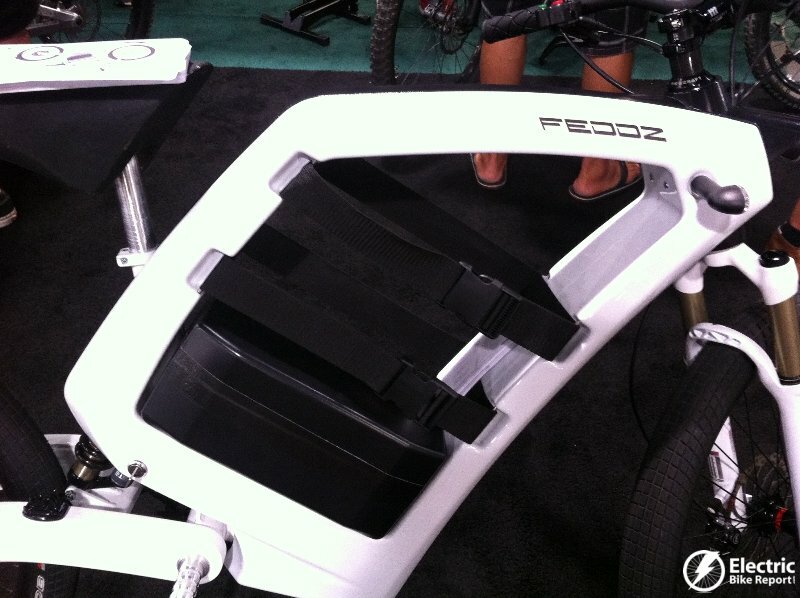 The Feddz does not have have a bicycle drivetrain, it just has pegs. 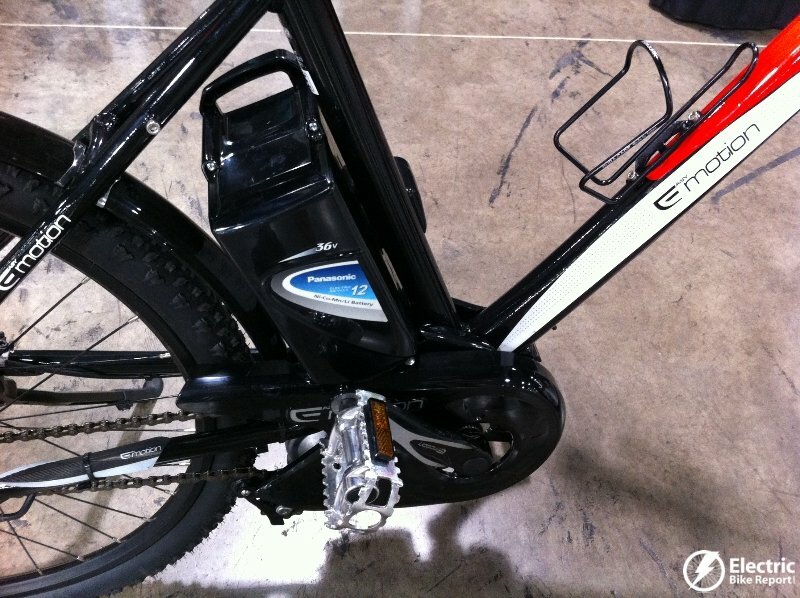 It will be offered in 2 different battery options with a claimed range of 70km (5,890 Euro) or 110 km (6,890 Euro). 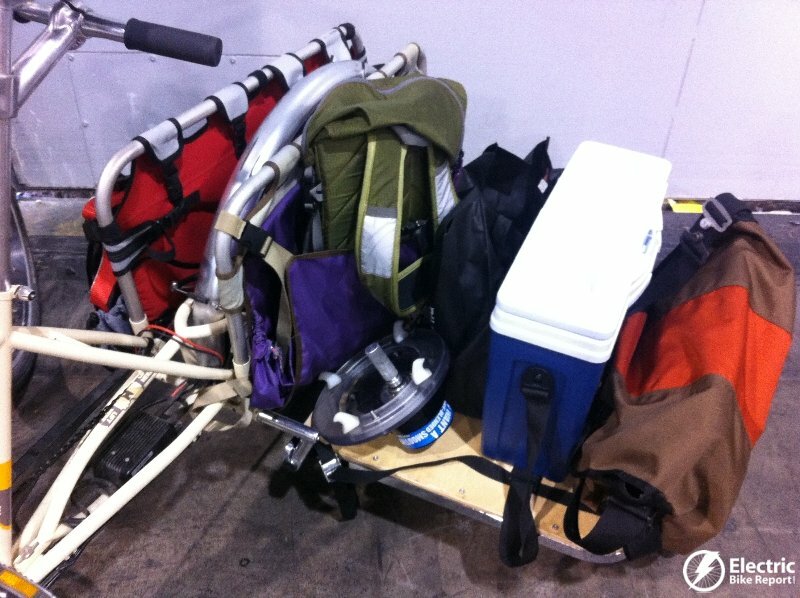 Xtracycle had a lot going on! 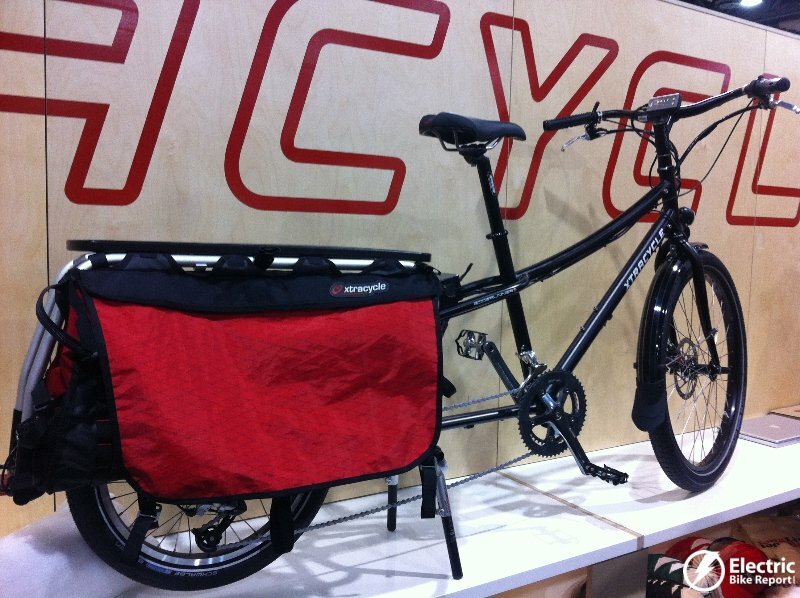 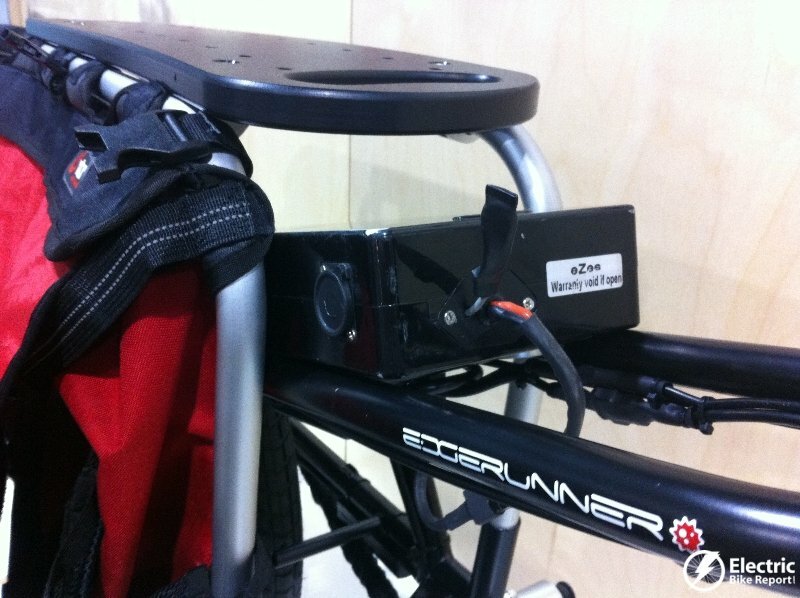 Their new Edgerunner cargo bike has an electric option that uses the eZee e-bike kit. 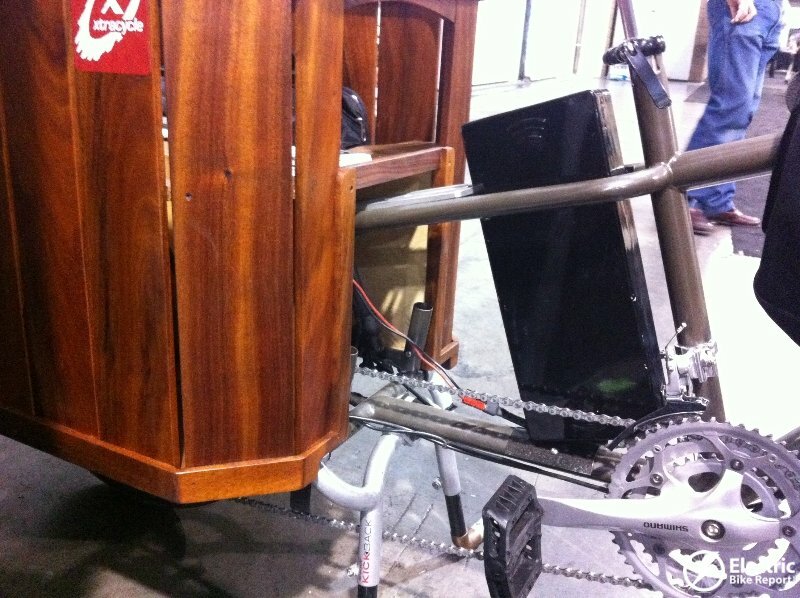 They also offer electrified versions of their Radish cargo bike and the Surley Big Dummy cargo. 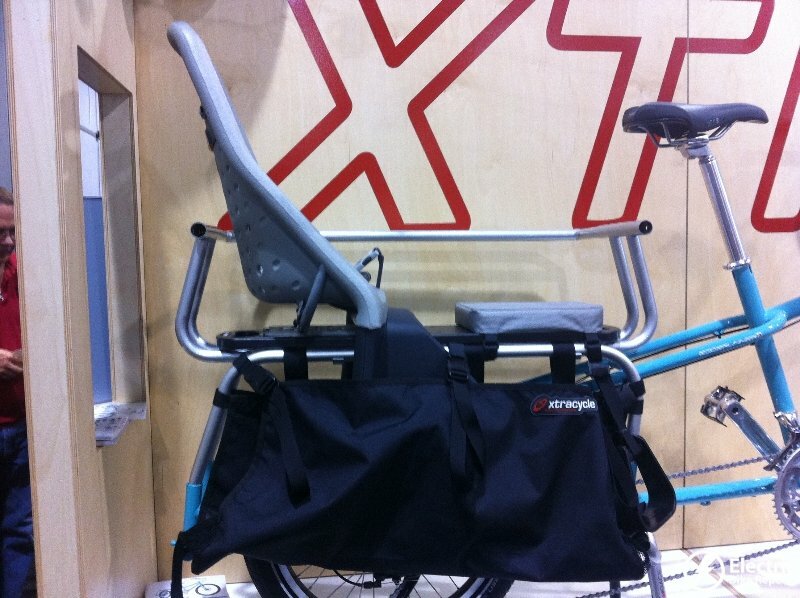 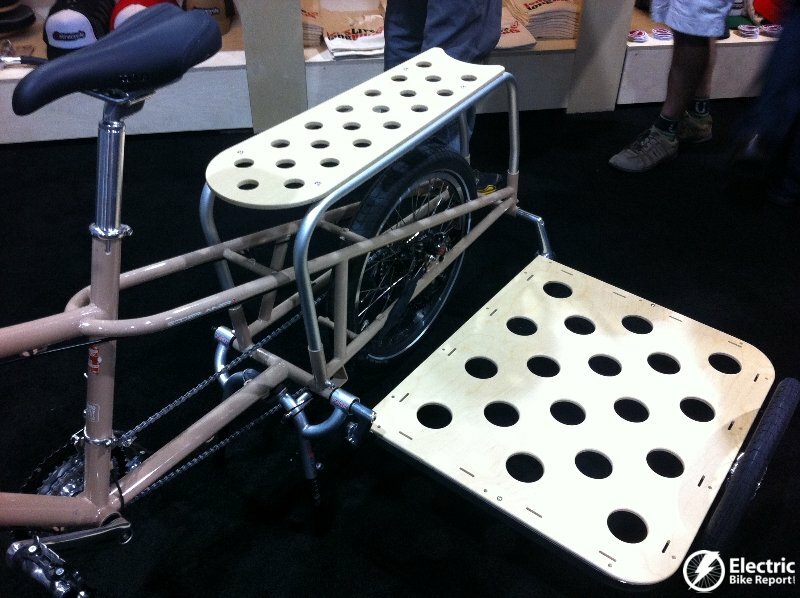 Xtracycle also revealed new accessories like the sidecar and a nice kid seat setup with rails. 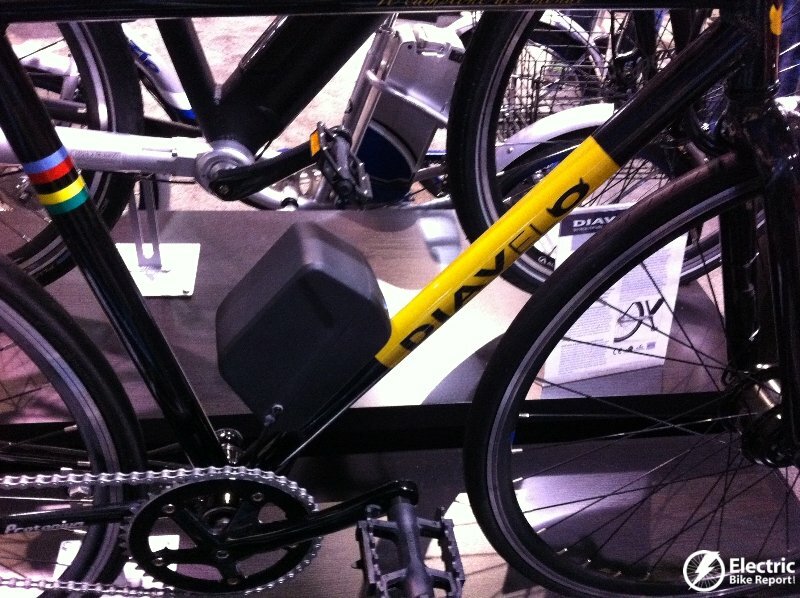 Diavelo is also another European brand electric bike that Currie Technologies is bringing to the US market. 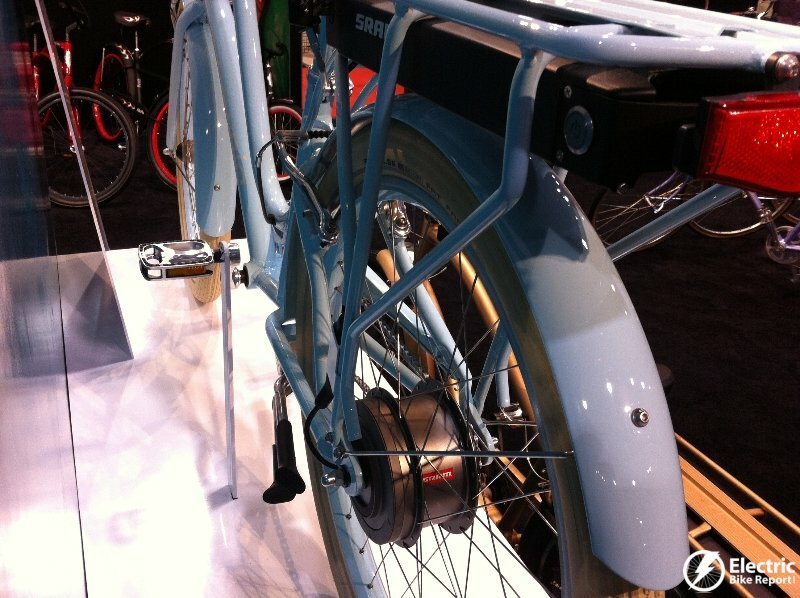 They have the Au2Bahn with 500 watts of power, the Fixie Lite urban style e-bike, and the Karden with Protanium shaft drive. 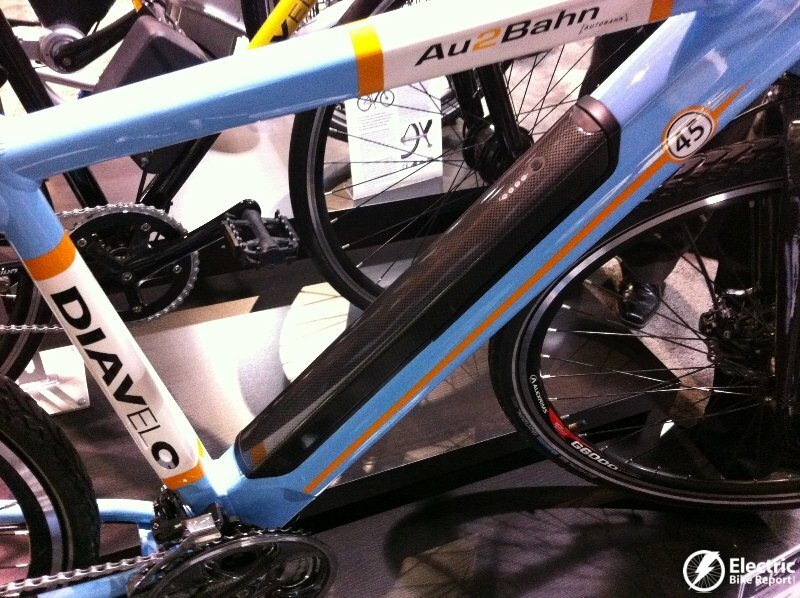 Here is more information on the Diavelo electric bikes. 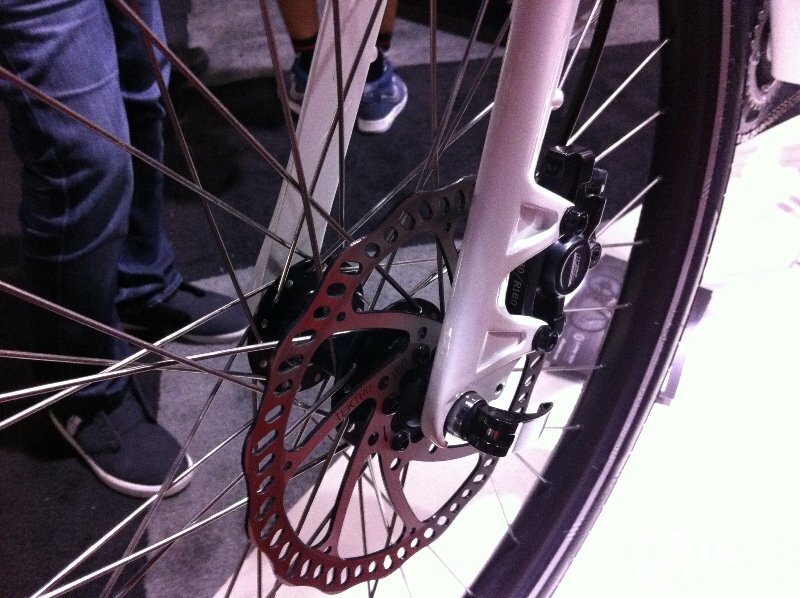 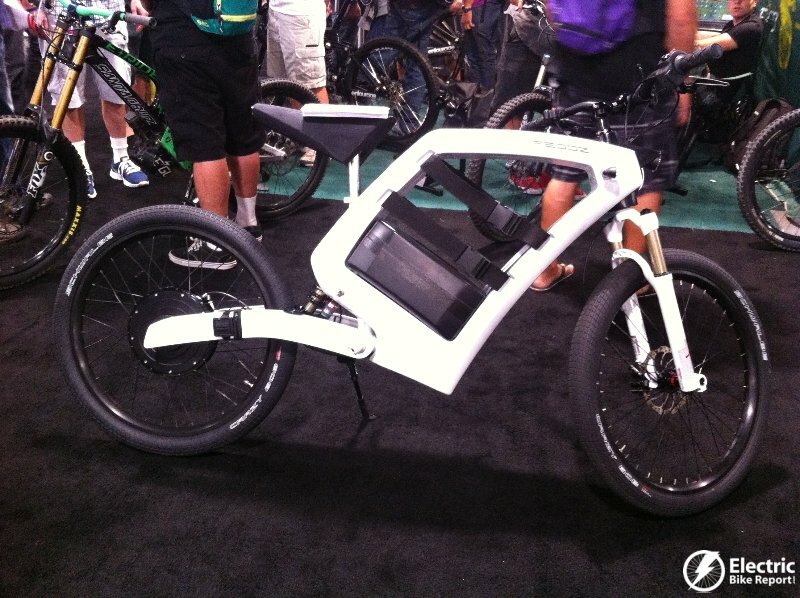 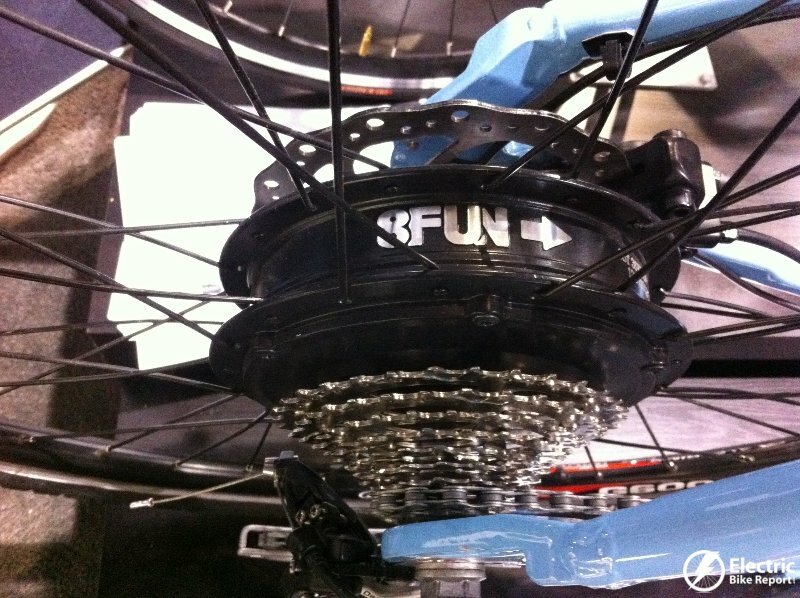 Check out Part 2 of the Electric Bike Scene at Interbike! 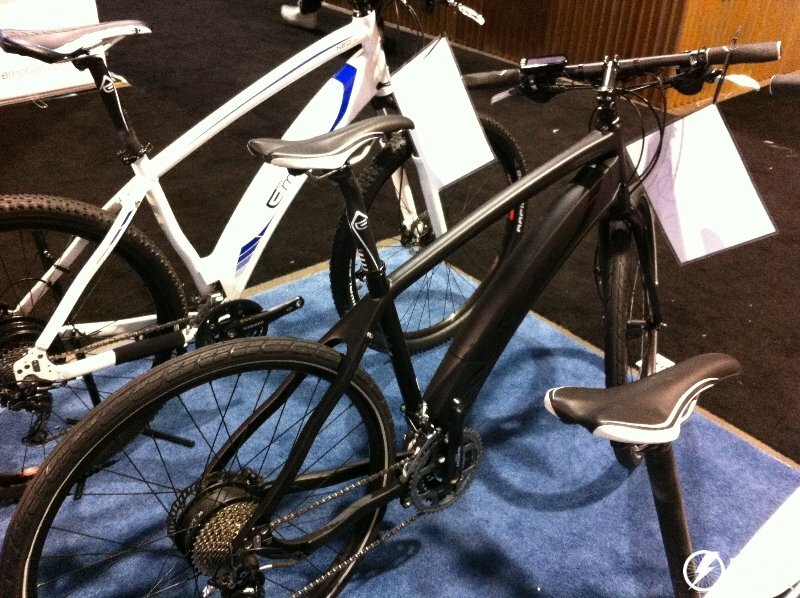 Please leave any comments about the bikes below. 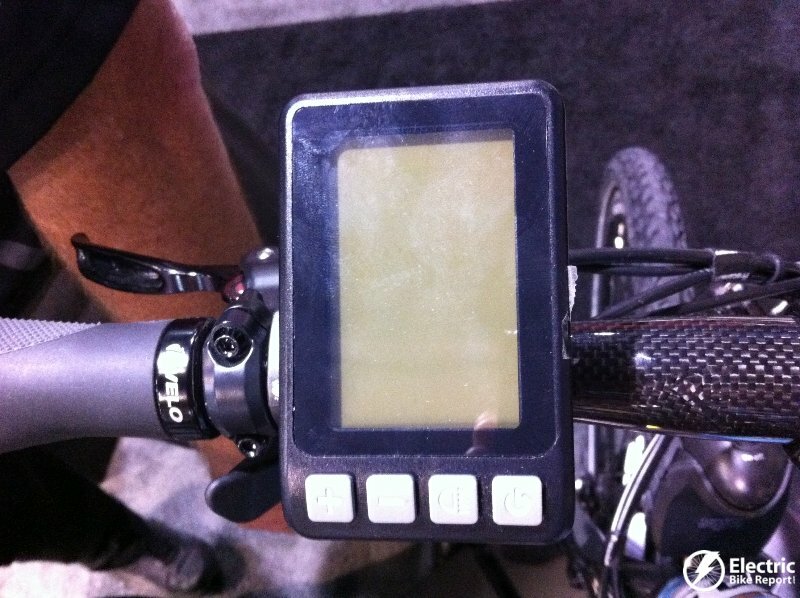 Thanks for the report and the many photos. 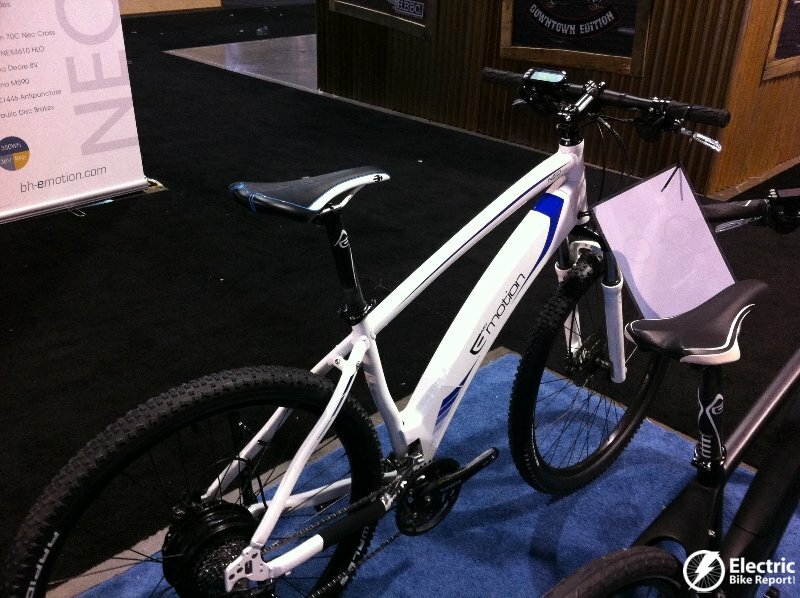 The future looks bright for e-bikes. 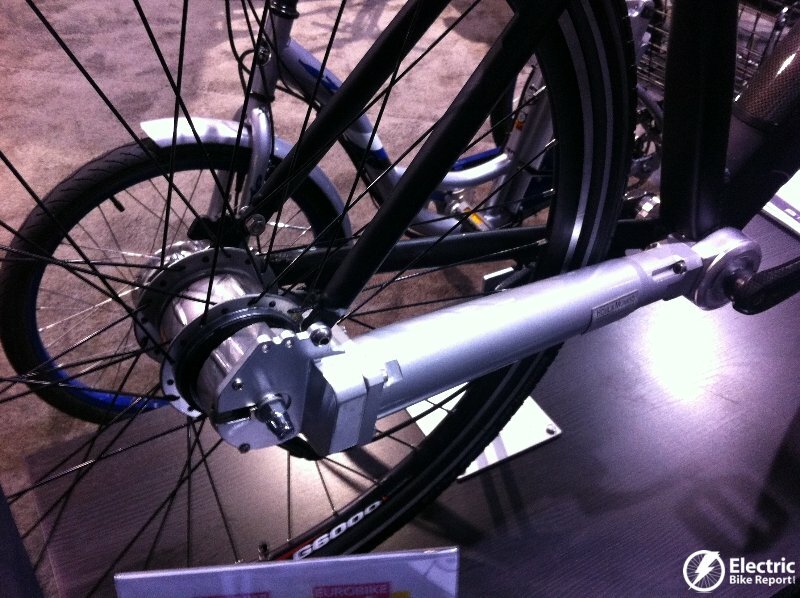 Did Kalkhoff present any of their new designs, like the Impulse motors? 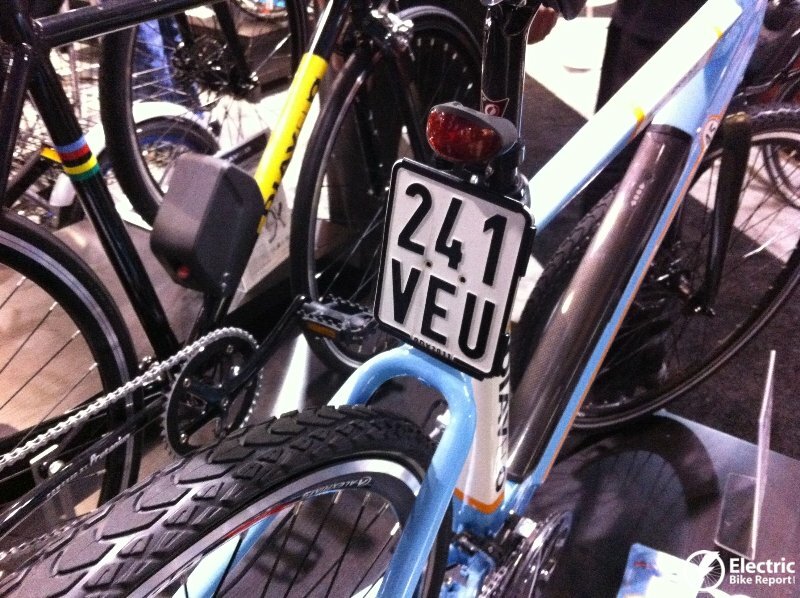 Hi Norm, I didn’t see Kalkhoff there. 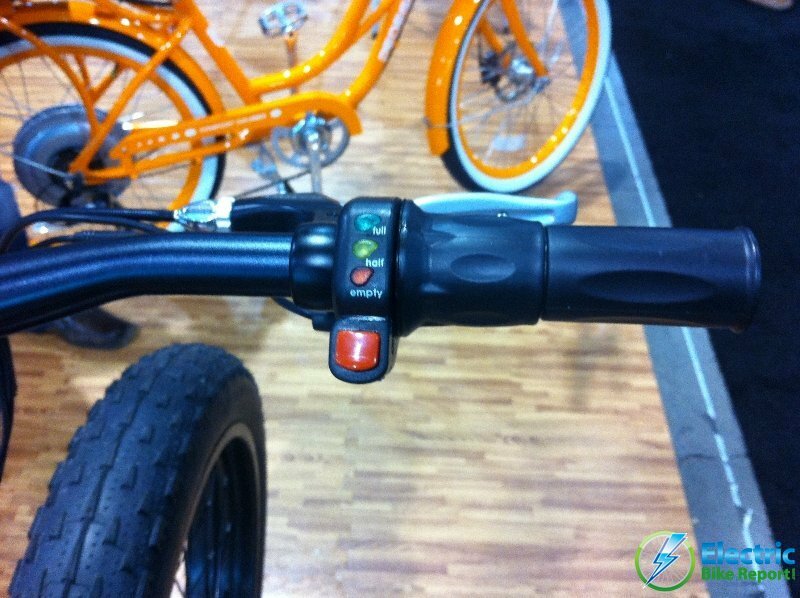 I will keep you posted on what I in the future. 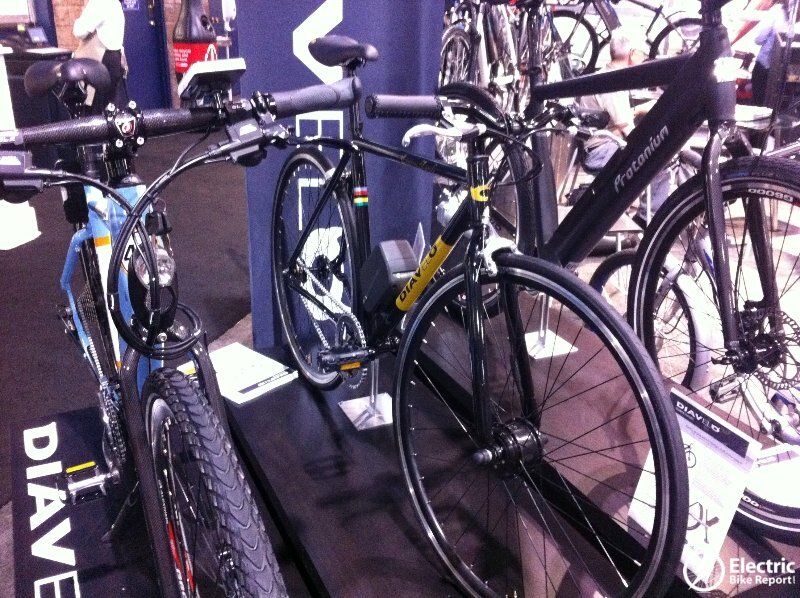 I know Prodeco had a big booth there but didn’t see anything about their bikes here. 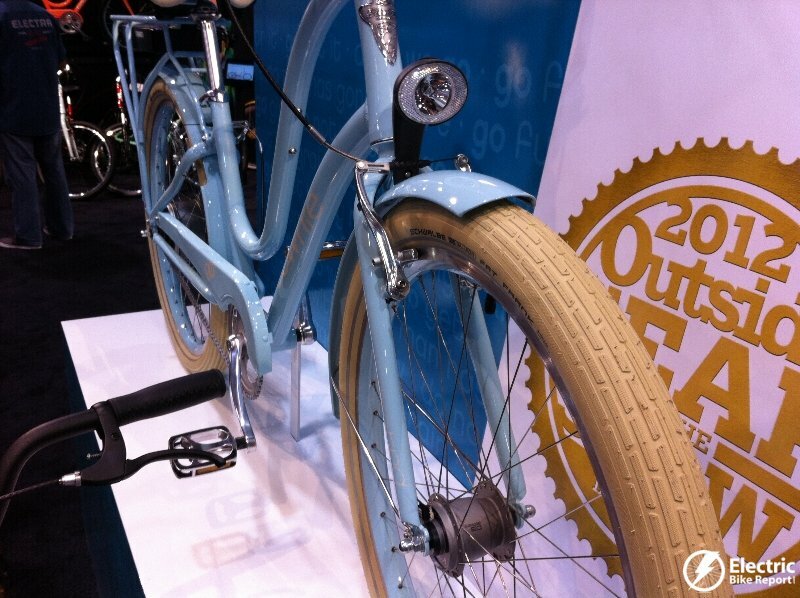 They have a scorching cool new model, the Outlaw, as well as updated versions of their standards. 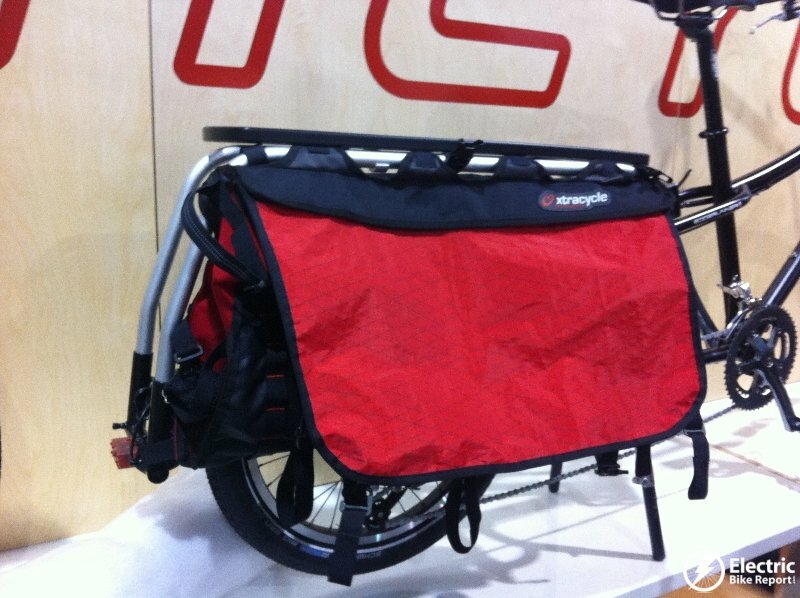 Seems like you never write about them – is there a reason? 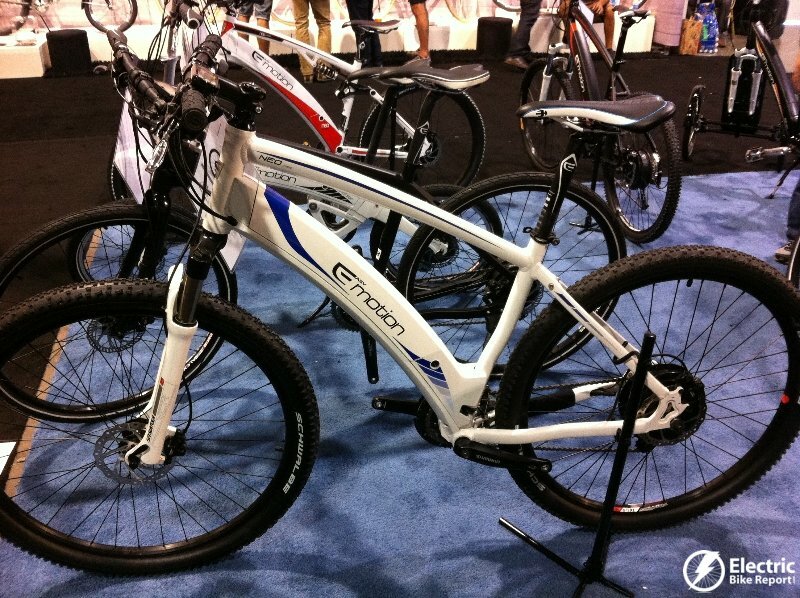 I love my Prodeco bike, it was affordable and is very durable. 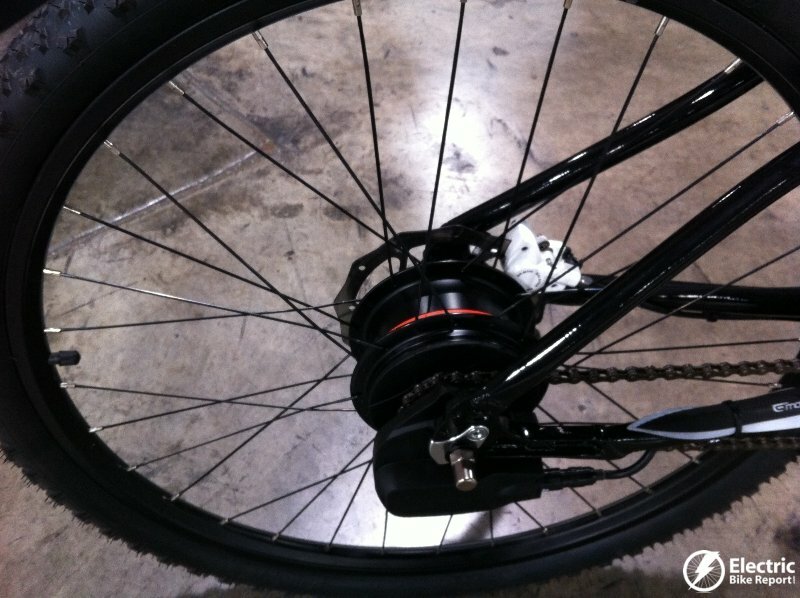 Would love to see you review their bikes. 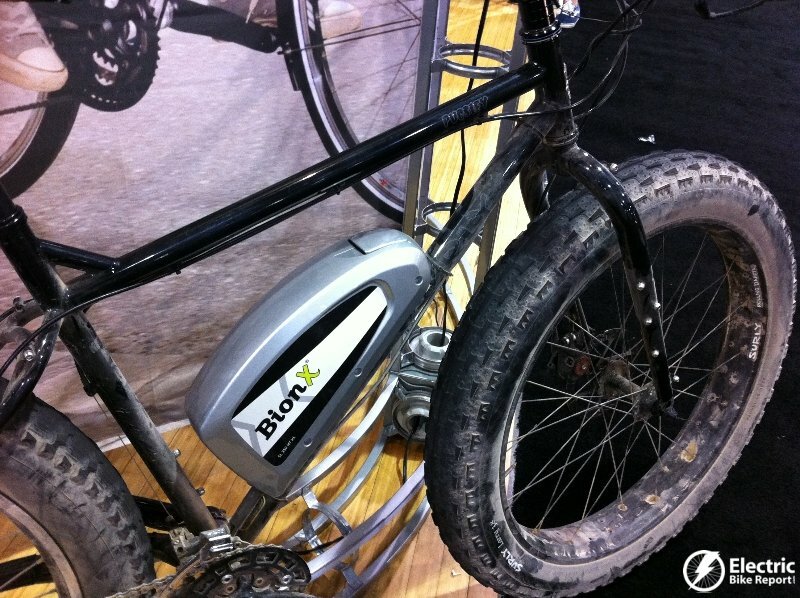 It’s nice to support built-in-usa businesses that are still price-competitive. Senior Biker asks a great question! 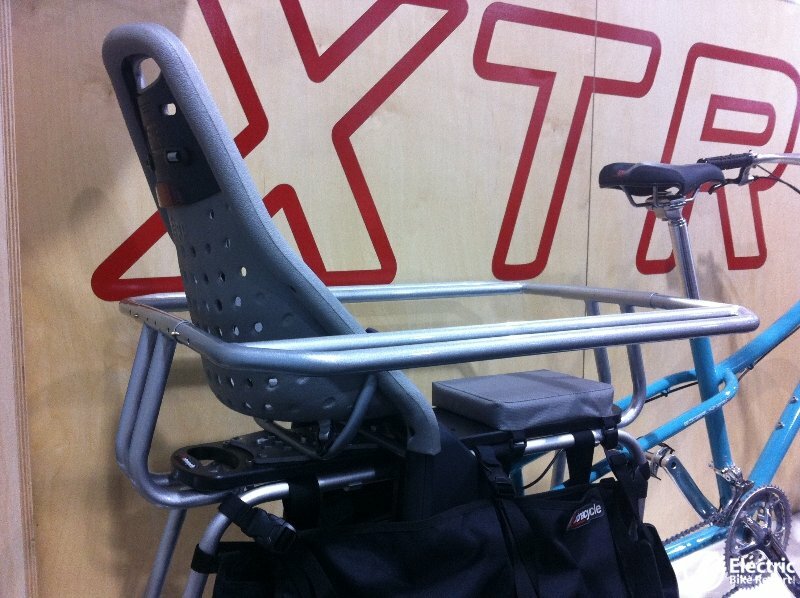 I was at Interbike and Prodeco’s new Outlaw model is incredible. 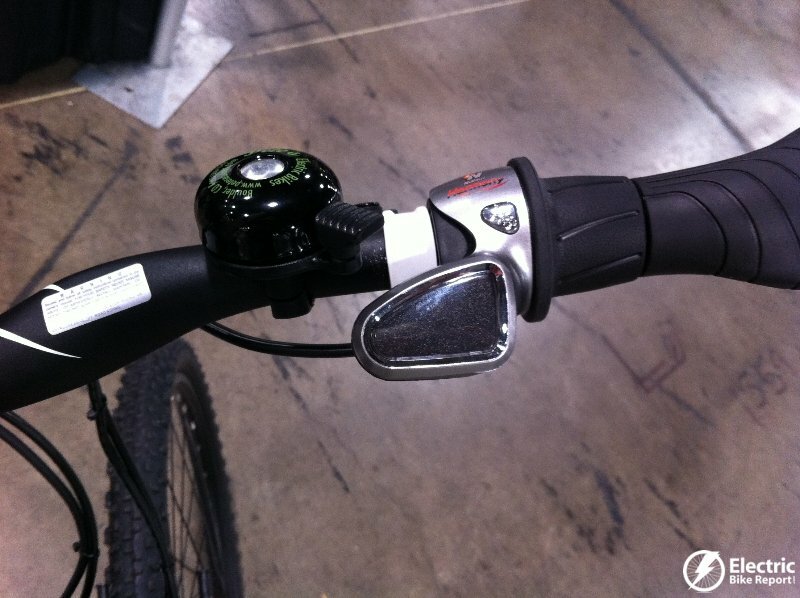 I test drove the Outlaw SS on the indoor track and all I could do was smile and say “wow”. 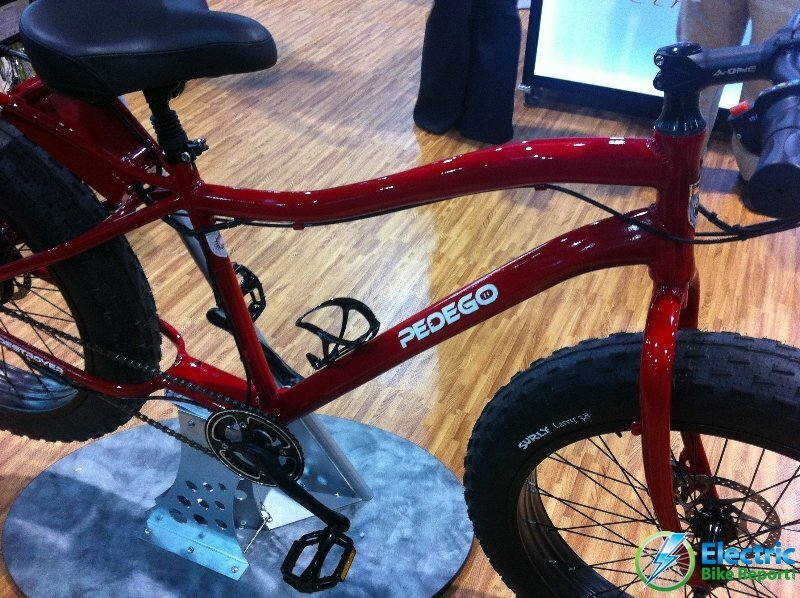 Nothing compares in my opinion to the price/value of Prodeco and I was at the show to source adding some new lines to what we sell, which currently is only Prodeco on our website http://www.goebikes.com. 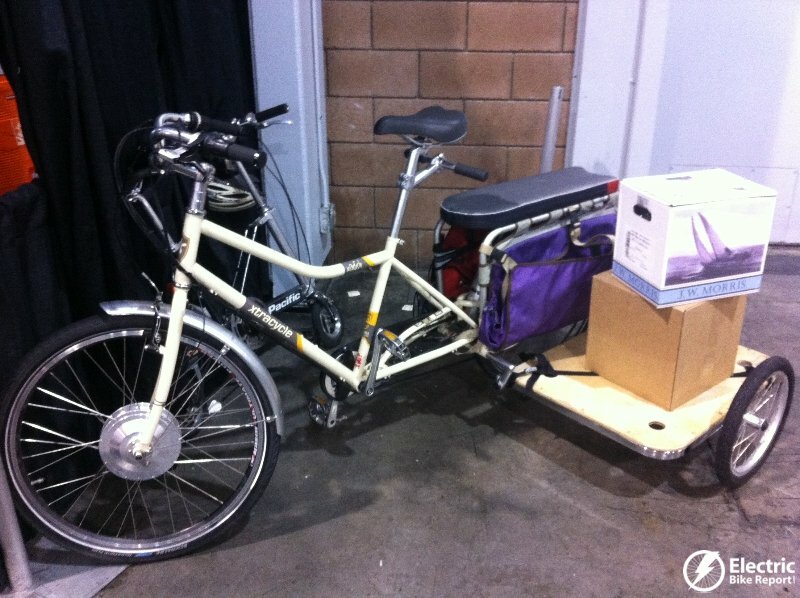 I’ve been a dealer over a year and love their reliability! 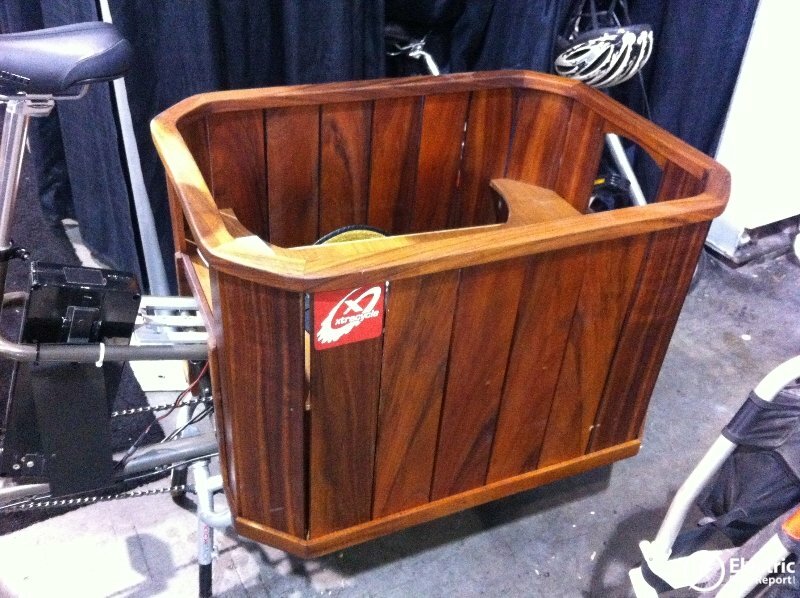 I look forward to seeing your report when you do focus on Prodeco. 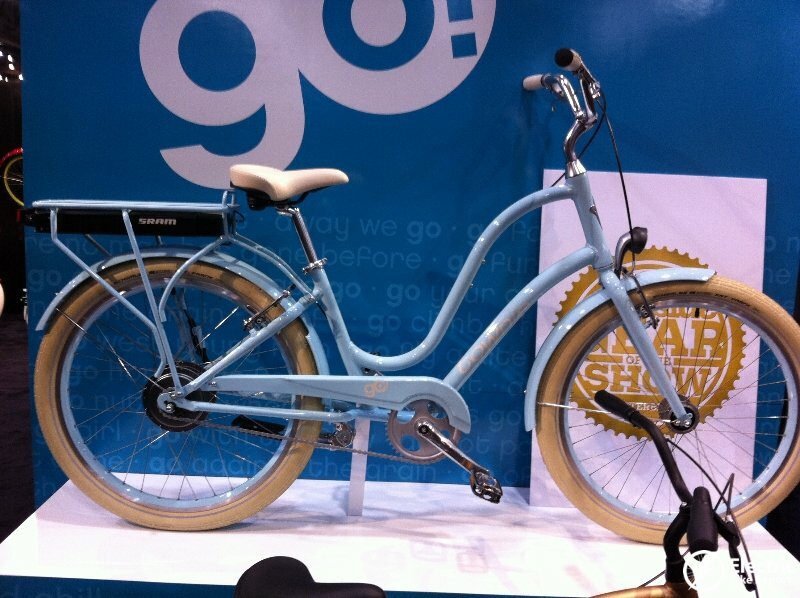 Stay tuned for some Prodeco reviews! 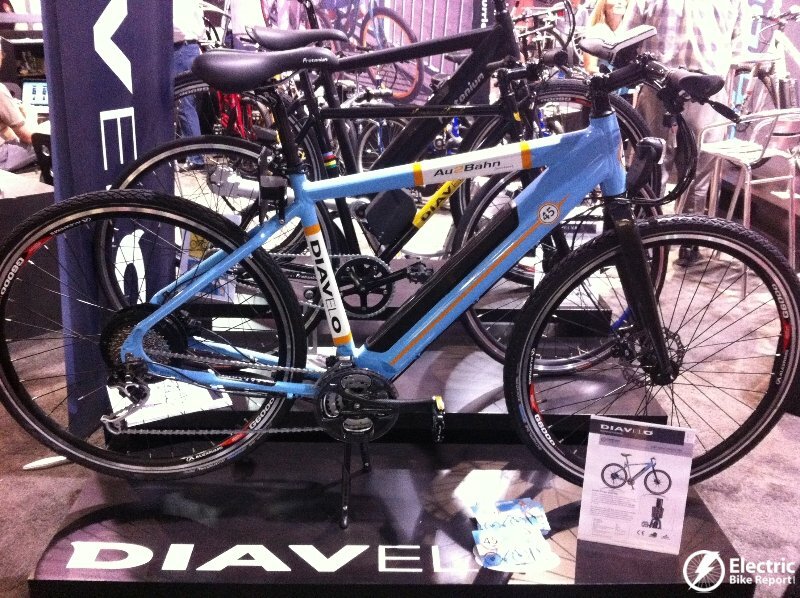 How do you rate Prodeco? 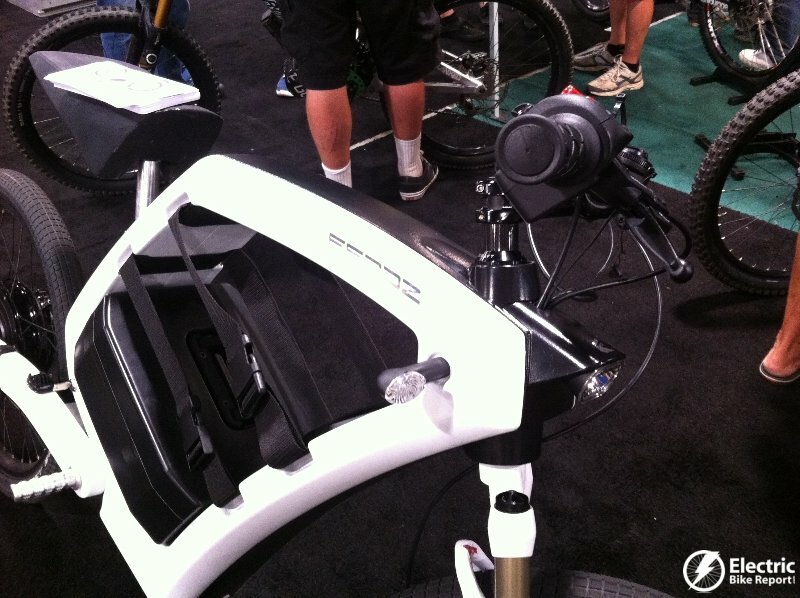 How is the new Outlaw? 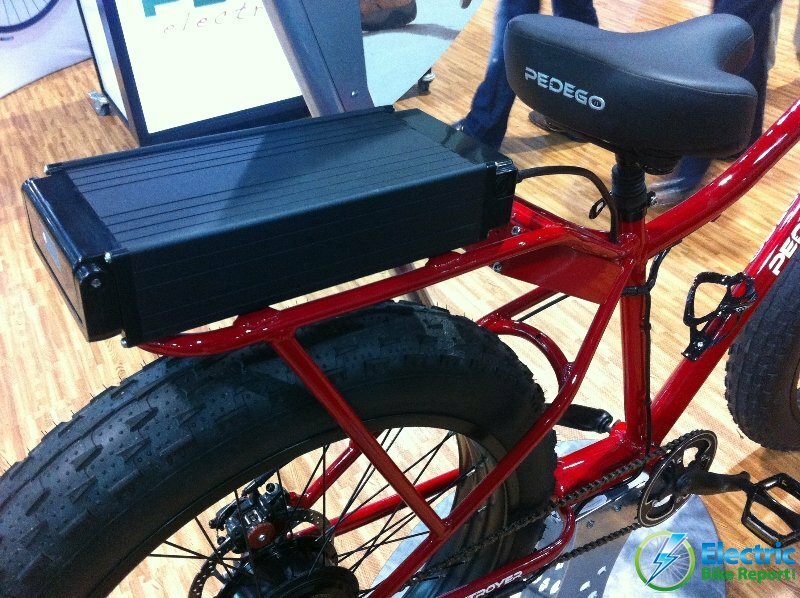 Hi Joel, I need to look into the Prodeco bikes more. 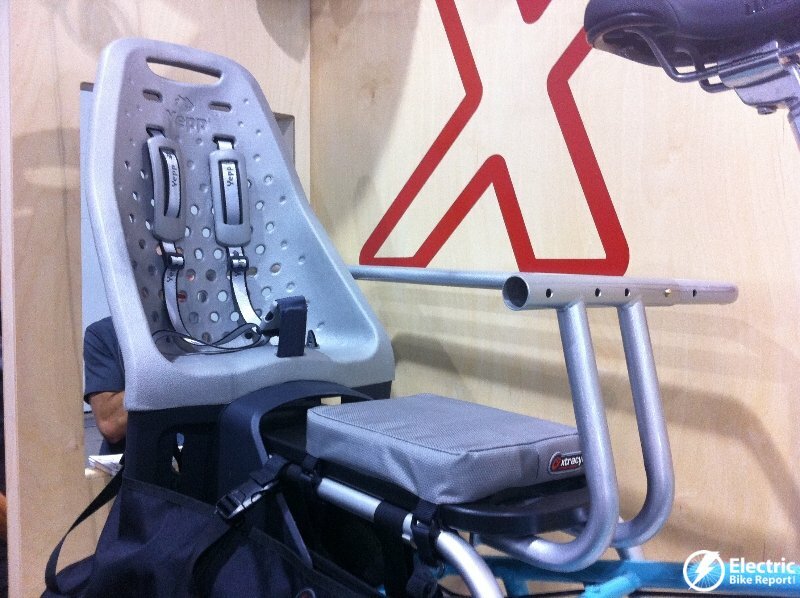 I will keep you posted on any Prodeco reviews coming up. 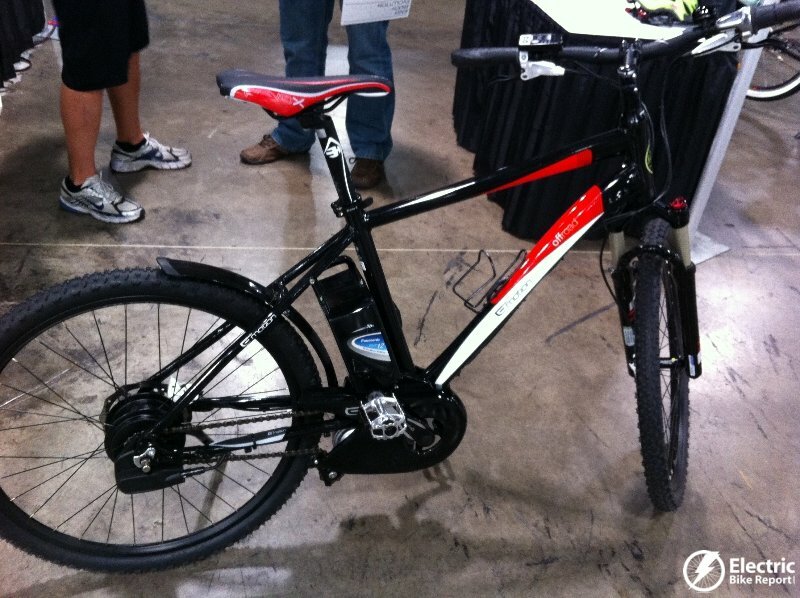 love getting the newz. 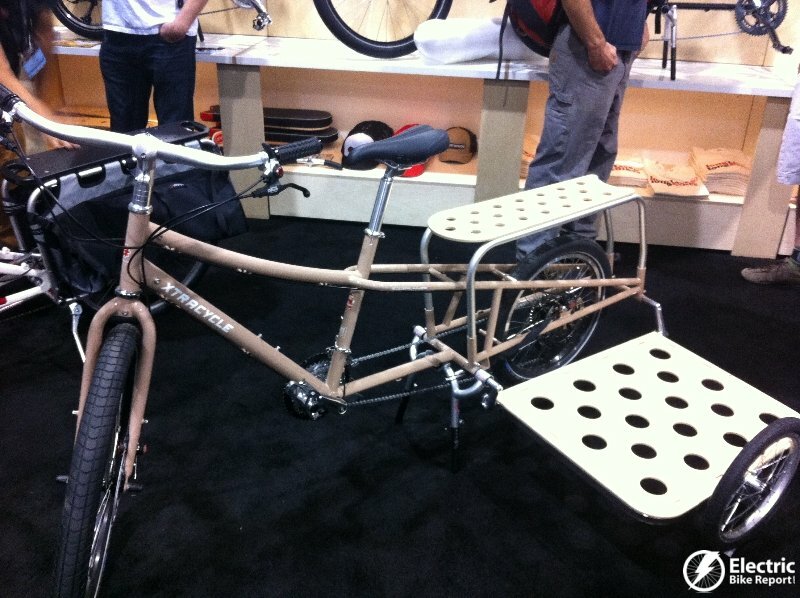 Feel like i a bit ahead of times here in NZ.